The discovery of the tomb was made in County Meath and within the Brú na Bóinne World Heritage Site. This area is within a loop of the Boyne River and contains three of the world’s most famous passage tombs; Newgrange, Dowth, and Knowth. It is estimated that there are almost one hundred more ancient monuments in the area. The heritage site is regarded as one of the most important prehistoric landscapes in the world. It is believed that this part of Meath was of considerable religious significance in the stone age and later. The find was made near Dowth Hall, an 18 th-century mansion on land owned by the agri-technology company Devenish. The company has established a research farm in the area in recent years in order to study methods for sustainable farming. The Devenish lands contain monuments from the stone age, including a Late Neolithic henge, an oval-shaped earthwork. A middle Neolithic tomb and an enclosure from the Bronze Age are also located on the company’s property. There are also, reports the Agriland website, ‘at least two high-status Early Medieval enclosures’ in the locality. The Belfast-based company decided to conduct archaeological investigations of their lands given its rich heritage. In recent weeks there have been several archaeological finds on the company’s lands. The passage tomb was uncovered by archaeologists working for the company in association with experts from the archaeological department of University College Dublin. Dr. Clíodhna Ní Lionáin, Devenish’s lead archaeologist for the project and her team uncovered the entrance to the passage tomb, after some preliminary digging. Passage tombs consist of a narrow passageway that leads to a number of burial chambers. The team of experts has found two small burial chambers, in the western section of the tomb. Archaeologists are investigating another two satellite tombs, that were built adjacent to the main monument. According to RTE, the Irish State broadcaster, Ní Lionáin and her colleagues have hailed the tomb as "the find of a lifetime”. The passage tomb has been provisionally dated to be about 5,500 years old a time when Ireland was becoming an agricultural society. Early investigations indicate that a massive stone cairn, made of smaller stones was raised over the tomb and this over time was covered by soil and grass. The perimeter of the cairn was encircled by a ring of standing stones, that was about 42 meters (138 feet) in diameter. At least six kerbstones that were part of the stone ring have been found so far. The discovery of the kerbstones is very important. One of them is decorated with many astonishing ornate carvings, mainly mysterious geometric spirals and shapes. These are some of the earliest and best-preserved examples of prehistoric art ever found in Ireland. They are being examined to see how they relate to other examples of carvings from the prehistoric past in Ireland. According to Breaking News , the Executive Chairman of Devenish was quoted as saying that they want to ‘preserve and protect this major heritage site for future generations’. There are also plans to open the Neolithic finds to the public for a week during Ireland’s upcoming National Heritage Week. It is expected that there will be more excavations at the site in the coming weeks and months. This find is very important and it once more shows the global importance of the Brú na Bóinne World Heritage Site. 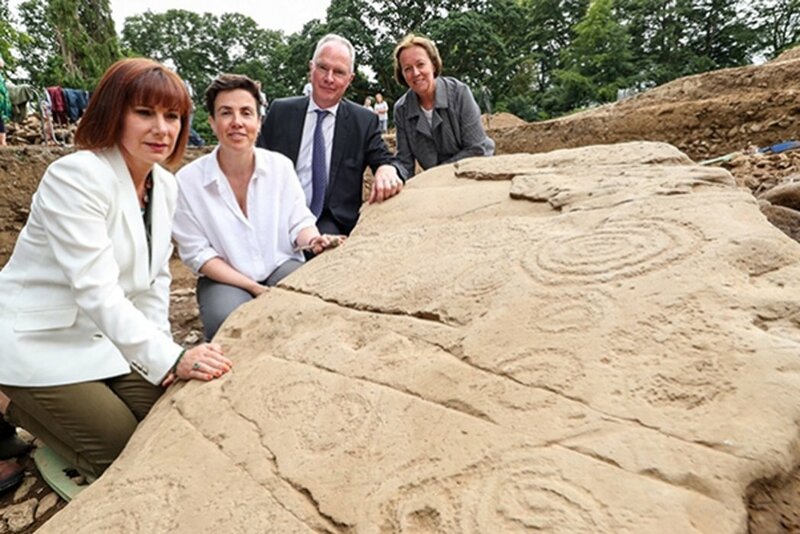 The find of the passage tomb will add to our knowledge of the ancient past and the carvings on the kerbstones allow for a greater understanding of Neolithic art. The discovery near Dowth Hall will be investigated for what they reveal about the society that built them, who were among Ireland’s first farmers. This find will also enable experts to discover more about passage tombs which are found all over western Europe.